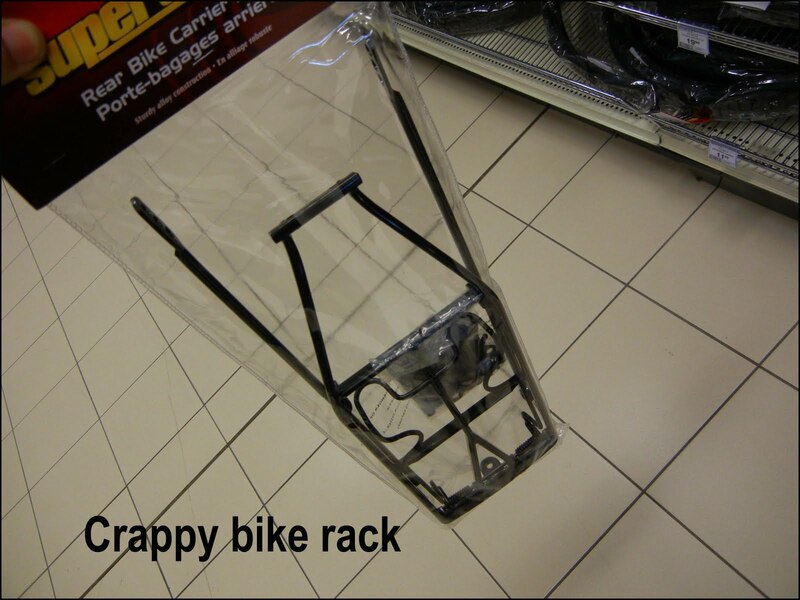 First things first, buy a proper rack. 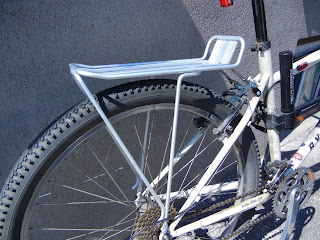 Do not grab one of those cheapy steel racks that you unfold the legs and bolt on your bike by squeezing the the living daylights out of your seat stays. Those press rivets that hold the legs will eventually give out and you'll have to fork the bucks for a decent rack anyways. Unless you already have one and it's free, stay away from those pieces of junk. For a few dollars more, invest in a lightweight aluminum cargo rack like the one pictured here. I have yet to go through one or see one busted. Just make sure that when you buy it, all the hardware, nuts and bolt are included. It should be. 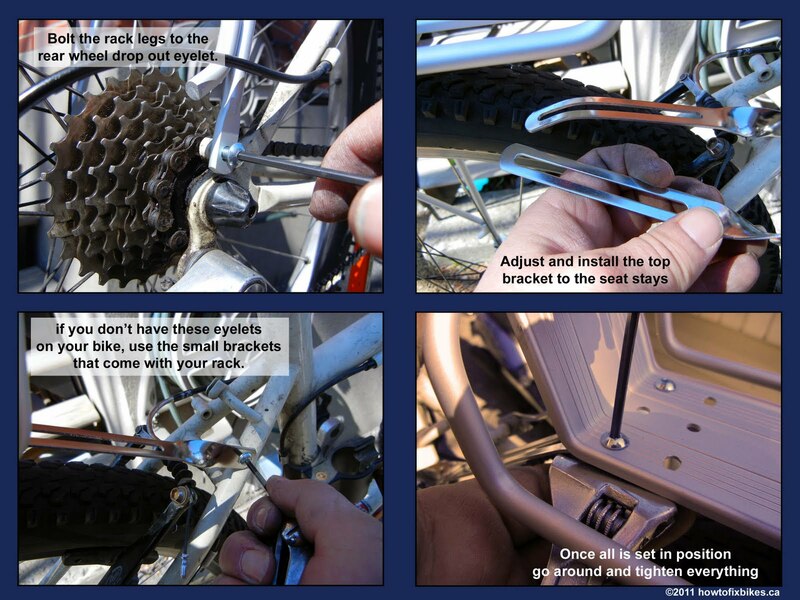 The first thing you should do is to bolt the legs on the eyelets at the bottom of the frame near the rear wheel nut. This is usually threaded so you can go right ahead with the bolt. 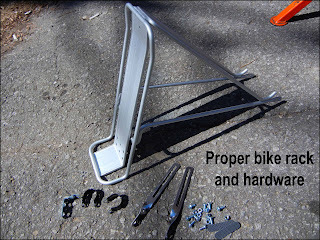 If not, use a nut provided with the rack, just make sure that you have enough clearance for that nut between the chain and the frame. Don't go too tight yet, we need to adjust the level of the rack. Next, pull out the bracket that will hold the rack to the seat stays on top. Bend the bracket if you need to and attach it with the nuts, bolts and small brackets. 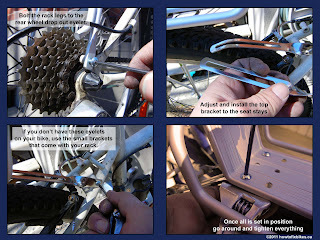 On this bike I had some threaded eyelets already there for that purpose, so all I needed was the bolts. Check to see if the rack is level, make sure that the installation hasn't affected the operation of the brake caliper and tightened everything down. Now you can strap all kinds of things to your bike and ride on safely with your cargo. Just make sure you go around all the bolts every so often to make sure they remain tight. Labels: "bike rack", "bike repair"
I added myself to follow your blog. I invite you to check out my blog and become a follower if you want too.